The 2017 Fall Meeting of the Society for International Hockey Research was held in Montréal, Québec, on the weekend of November 24-26. 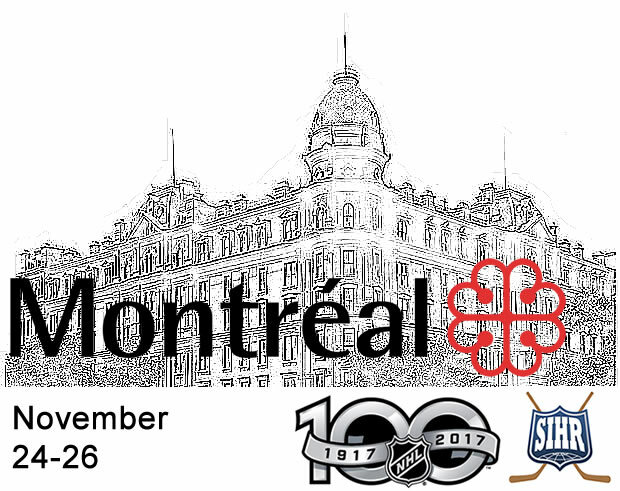 This particular weekend was chosen to coincide with the centennial of the National Hockey League, which was founded on November 26, 1917, at Montréal's Windsor Hotel. A beautiful late autumn afternoon greeted a large group of "early-bird" event participants on Friday, who enjoyed a walking tour of historic hockey sites. Led by Michel Vigneault, the godfather of Montreal hockey history, the group visited the site of the former Windsor Hotel where the National Hockey League was founded almost exactly 100 years before. Other stops included the fabled Montreal Amateur Athletic Association (MAAA) and the McCord Museum, as well as the parking garage which now stands on the site of the Victoria Skating Rink, a key part of the development of the game. While there, founding SIHR member Billy Georgette renewed his plea that the Society advocate for further recognizing and protecting the site, going so far as to suggest it was worthy of UNESCO World Heritage Site designation. The meet-and-greet that evening was in two parts, beginning with dinner and drinks at a restaurant in Old Montreal followed by a private pre-opening tour of the new exhibit "Passion: Hockey" at the nearby Pointe-à -Callière Museum. The exhibit features some of the items seen at the Canadian Museum of History during the Society's last meeting, but included additional items highlighting the Montreal Canadiens and the team's relationship with the city and the province as a whole. President Wayne Geen opened the Saturday meeting by addressing the group in both official languages. Bien fait Wayne! A condensed business meeting with reports from the president, secretary, website committee and membership manager revealed that the organization is in decent financial shape and that membership numbers remain steady. An update on the Society's application for charitable status with the Canada Revenue Agency was also given by Secretary Aubrey Ferguson, who informed the group that both the constitution and the letters patent would need to be modified in order to satisfy the CRA, at which time the application can be re-submitted. Details of a new deal which was reached for the redevelopment and maintenance of the website were discussed, and that work would begin soon. Host and past-president Jean-Patrice Martel gave an update on the long awaited Hockey News Archives project, which is delayed by contract wording, but should be resolved soon. President Geen gave an update on the status of the next meeting, which will take place in Parry Sound, Ontario, between May 25 and 27. The announcement of the 2018 fall meeting was met with excitement, when it was revealed that the Dallas Stars would be hosting the meeting. The exact date is not yet known, as it will depend on the NHL game schedule. More details about both meetings will be made available on the website and in the newsletter when possible. "The Mysterious Gerry Geran" was the title of the presentation delivered by Roger Godin, the resident historian with the Minnesota Wild. Godin, who specializes in researching American born players, chronicled the life of the first US born player to skate in the NHL, which left as many questions as it answered. André Rivest, a journalist with La Presse, delivered a fascinating look at the life and work of photographer Roger St-Jean. His portfolio includes both iconic and obscure photographs of Montreal Canadiens players both on and off the ice, as well as many celebrities from the 1950s. The charismatic and fun loving photographer seems to have pioneered the selfie and the photo-bomb. Former WHA and NHL goaltender Gilles Gratton made an appearance with author Greg Oliver. The pair discussed what led to their collaboration on the recent book Gratoony the Loony: The Wild, Unpredictable Life of Gilles Gratton. Gilles pulls no punches and tells it like it is, curse words and all, to the delight of all in attendance. More technical presentations were made by Simon Grondin, who analyzed the rivalry between the Canadiens and Bruins since the the latter joined the league, who was followed by Alain Usereau of RDS, who discussed the slow move towards advanced analytics in the NHL. Following a lunch break, host Jean-Patrice Martel moderated a video conference discussing the digitization of NHL records with Gary Meagher, executive vice-president, communications, and his associates Benny Ercolani and Brendon Crossman. Quebec author Marc Durand delivered a presentation about Jean Béliveau, whom he recently wrote a book about. He was followed by Andrew Ross who discussed the influence of James Norris on early NHL teams. Rounding out the day was former Montreal Gazette and current nhl.com writer Dave Stubbs, who delivered a series of heartfelt personal stories from his decades of covering the Canadiens. Following the meeting, a large number of members attended the Canadiens vs Sabres game, which, surely by coincidence, was the start of the team's current winning streak. A small number of people took part in the tour of the offices of La Presse, hosted by André Rivest, who led the group behind the curtain, and shared copies of many historic clippings and photos.